You know when you go to a family reunion and you know you know everybody, but it feels uncomfortable and comfortable at the same time. Like, deja vu… you know you’ve been there before but at the same time it’s new every time. Probably not. But that’s how my family reunions are because everybody lives far away. Anyway, that’s what it feels like typing on this blog right now. I’ve been here before, but it’s been so long it’s like it’s new and old at the same time. I can’t believe I don’t write on this thing more, but I’ve been consumed. It’s been a busy season of life for Andy (yep, that was third person). I’m planning a wedding with my lovely bride-to-be. I’m working like there is no tomorrow. Becoming the director of a nonprofit is not easy. My daily schedule usually consists of spending some of the morning at home to be by myself and then I work from late morning till about 9-10 at night, then I go to my fiancé’s house till about 12:30 and then it’s home to bed and back to it again. Not that that’s a good excuse for not writing, but my brain is so focused on two things. (1) Work (2) Fiancé and Wedding. Not to mention the constant struggle to get some quiet time to spend with God, that’s a given. And something I’m not doing great at, currently. But like this blog post, it’s time to get back into some good, old habits. It’s a new day. I have a secret desire (not so much of a secret now, this is the world wide web after all) to write a book one day. This blog is my testing ground. So, if I’m serious about being a writer… I really should write. I mean, a person serious about being a competitive eater doesn’t practice by starving himself right? Maybe he does.. ok, bad example. You get the point. I read blogs like Carlos Whittaker’s and People of the Second Chance and Anne Jackson’s and I just wonder… “Where do they get the time?” I know they’ve got to be busier than me. They’ve got wives and husbands, kids and book tours. Radio tours and full time jobs on top of it all. I have one job, no book or radio tour, no kids and I’m planning a wedding. How can I not find the time? Maybe they don’t sleep. That’s got be it. They sleep 37 minutes a night. Jon Acuff is another one. If I were half as witty as he is, I’d be golden. This guy too. Maybe I could spend some time writing instead of reading everybody else’s blog?? No, that’s not fun. You’ve got to read to learn and grow. Anyway, this is a long vomit-type blog to say that I’m still committed to this ‘ol thing. If you’re a subscriber or reader, stick around! There may be a day when your RSS feed has a little number next to my name letting you know that I’ve written something. (that always get my psyched when I see the (1) or (6) or whatever next to my rss feed). Ok gang, thanks for reading… I’ll be back. Oh and I know I’ve said this like 1 bazillion times. But I HAVE to do P90x starting this week because my wedding is in 93 days. Yeah, 93. Do the math. I have 3 days to spare if I start now. Tony Horton, here I come. 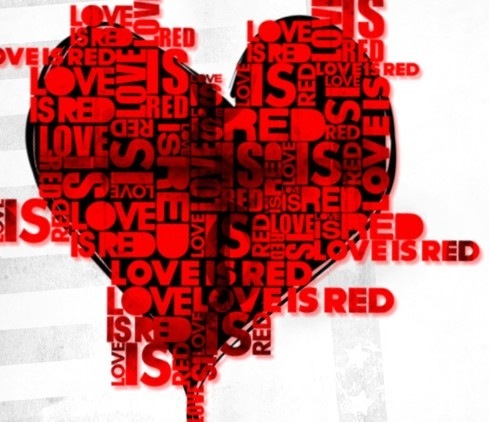 I had the opportunity to go for a day to a great conference in Canton, OH called Love Is Red. Check out their website at here. This morning, youth pastor Mike Roberts Jr. spoke on the subject of the cross and it was a powerful sermon. Mike’s humor, honesty, and insight brought a new perspective to an otherwise well known passage of scripture. He spoke from Mark 15, the portion of the Bible that outlines Jesus’ crucifixion. In reading Mark 15 you find that Jesus is being crucified with his followers, supporters, as well as his critics all present watching as this influential man is put to death. For the disciples it was probably the darkest time in their lives. They’ve spent the last three years of their lives following this man, working to further his mission and message and here they are on hillside watching it all fall apart as their leader struggles for breath getting closer to death with every second. But what they didn’t realize was what was happening behind the scenes and what God was accomplishing in this, his Son’s, death. You see, Jesus breathed three words before he died and with those three words gave all of us a hope that is beyond understanding. “It is finished.” When Jesus said these words, what was accomplished still resonates today. You see, we’re all sinners, and we are supposed to be separated from God for all of eternity, unless of course somebody makes restitution for our sins. Unless somebody pays our way back to God. When Jesus died, this is what he accomplished. He paid our debt to God. He covered our failures and bridged the gap. So while the crucifixion was the darkest time in the disciples entire life, it was also the time that God was doing His greatest work. The question Mike Roberts Jr. posed today is a great one and I want to share it with you. Is it possible that in the darkest time of your life that God is doing His greatest work in you? Is it possible that in the midst of your addiction, your parents’ divorce, the scars healing on your arms from self affliction, the sexual regrets you may carry – in the midst of those dark periods, is it possible that God could be doing His greatest work in you? This question should give us hope. That’s what the cross represents. Hope. When you are lost, searching, scared, lonely, depressed, confused, you’re not alone. The disciples probably felt all that and more as they watched their Savior struggle for breath, but it was in that moment that God was doing His greatest work for mankind. Jesus did die. They suffered fear and some questioned their belief, but Jesus rose from the dead three days later and what was their darkest moment became their greatest joy. What is your dark moment? Where do you find yourself that you wish you could just get away from? Look to the cross and find hope that in that moment – in that dark place – God wants to do His greatest work in you. Doing some thinking the other day, I thought something that I want to hear your feedback on. I had the opportunity to eat lunch with a great group of people today at Millwood, Inc. Every Tuesday and Thursday they have lunch prepared in their cafeteria. Today they had delicious cheeseburgers on what seemed like pretzel buns… delicious. Anyway, I digress. After lunch they had a special guest deliver a short devotion and then were getting ready to close in prayer. Before they closed in prayer, the human resources director informed the group that a member of the Millwood family had been sent home from the hospital and they were stopping Chemo on his stage 4 cancer. Life doesn’t seem fair sometimes. What happened next is something that simply doesn’t happen in A LOT of companies across the country. At the urging of the company president, everybody in the room stood around and grabbed hands in a circle as we were all led in prayer by the HR director. It was really touching and almost surreal, I felt really out of place because I didn’t know the person they were praying for and had no connection to him other than the deep concern and sadness I felt in the room from the people who did know him. What was great about the experience for me was that I was standing in the middle of a family made of a coworkers. It was an amazing work environment. Everybody seemed to love their job and execute it with excellence. As the leader of an organization (a very small one compared to this large corporation) I hope I am able to create an environment for my staff and volunteers that is as welcome and inviting as I was in the middle of today. Thanks Millwood for the experience and the lesson. I’ll admit that I wasn’t very interested in this movie until after it blew everybody’s expectations out of the water with all it’s Oscar success – Winning multiple awards including best screenplay, best director, and best picture of the year. I rented it two days later and was not disappointed. Before I rented it people had told me that it was slow, boring, they turned it off before it was over and that is a big big mistake. This movie is not a “war-action-movie.” It’s a drama – that happens to be surrounded by war. The film isn’t about war. It’s a man, in war. Almost the same way that Iraq itself isn’t a country about war, but there is war in Iraq. I sat through part of the movie amazed at what it must be like to look down from your home and see military trucks rolling down the streets. We don’t know what that’s like in America, we’ve never faced a war being waged on our soil. Not since the civil war at least. I can’t imagine what it would be like to wake up and look out my window and not be able to go outside because there is a roadside bomb that will blow me to pieces if I get too close. This movie is jam-packed with action, but not the kind with car chases and shoot outs. It’s the action of one man’s struggle to find who he is outside of war after being so engulfed in it. The dialogue is slow and steady, but precise and wastes nothing. The cavalier attitude of the main character immediately draws you into a sort of twisted relationship with him. This movie made me want to do my job better. It made me want to walk into a hostile situation, with a righteous disregard for my own safety and comfort and do my job with excellence because – dang it – the job needs to get done. But at the same time, the film is a warning: that what we do should never take the place of who we are because the two are – and should always remain – something entirely separate. If you don’t mind F-bombs and some blood, watch this movie. And watch it all the way through to the end, because it’s the last five minutes of this movie that wrap everything together leaving you sitting there as the credits roll wishing it wasn’t over. If you’ve seen The Hurt Locker, what did you think? Do you agree with my thoughts or disagree? I want to hear your thoughts on the film. I’m no critic, but I like movies. I like movies a lot. I like going to a good theater, where the people are nice and the theaters are clean and the sound is good. The experience is cool to me. You get to see into the worlds of other people and learn and be entertained. (Even if it is getting more and more expensive). But, that being said, I’m going to start reviewing some movies on here. I know, I know. Everybody does it. I get annoyed with it sometimes because I don’t really care to hear people who are not experts tell me about movies that I haven’t seen yet. So, what I’m going to do to not be as annoying as some reviews I read is simply change it up a bit. I’m going to come right and saw that I’m a biased, over-thinking movie lover that looks way into the stories, principles, symbolisms in movies and tries to learn something about life, faith, culture and people through them. Sometimes it’s silly and other times profound, but you’re going to get some insight into my mind as I break down the insight I try to gain from other people’s movie minds. Confused yet? If not, just wait, you might be eventually.. 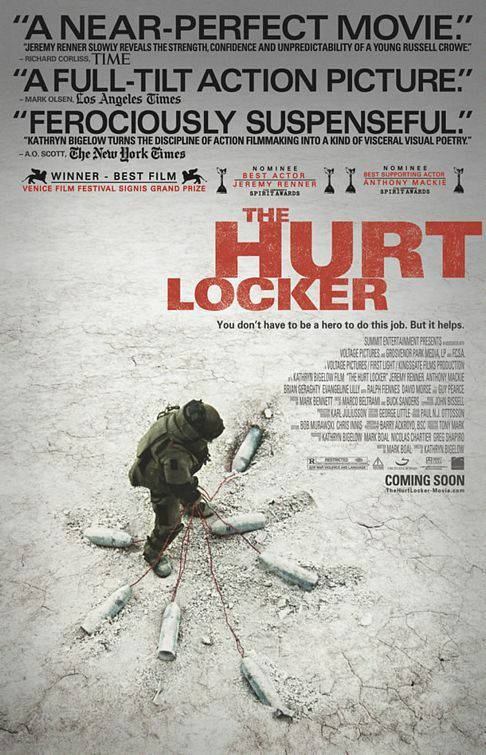 Anyway, first movie up for review: The Hurt Locker.